This page contains a translation into English of the lyrics to the popular song "A’ala Baabi Wa-Aif Amarain", which was sung by Melhelm Barakaat. Also included is a transliteration of the Arabic lyrics into the Roman alphabet so you can sing along if you like. Other ways the song title might be spelled include "Ala Babee Waeff Amarain", "A La Babi Waef Amaren", "Ala Baby Wef Amarine", or "Ala Baby Waef Amarain". People sometimes write the singer's name as "Mel7em Barakat." This song appeared on an album, released in 2004, titled Layali Dubai. 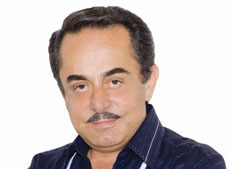 Melhem Barakat was born in 1944 in Lebanon. As a child, he showed his talent for singing at school parties. He attended the prestigious Rahbani School which launched the careers of many artists. He became known not only for his singing voice, but also for his talents as a composer. A’ala baabi wa-aif amarain. Two moons are standing at my door. Wahed bilsama, wil taani aghla imnil-a’ain, ib-yifham bilwama. One is in the sky and the other one is more precious than the eye understand things right away. A’ala baabi, a’ala baabi wa-aif amarain. At my door, at my door, two moons are standing. Aah! Ya amarna bil layaali, nahna ila’aashi-ein. Aah! O moon in the night, we are lovers. Ya talaia’ bil a’alaali, khaleina sahraneen. Oh you come up so high, you make us stay awake all night. Wana nijmah bain amarain, wana basmah bain hila-lain. And I am a star between two moons, and I am a smile between two crescents. W-il-naas a’ind-ha amar, wana a’indi amarain. And people have one moon, but me, I have two. Aah ya imdawi ouloob a’atshanah. Irwi ila’atshaneen, yalli ia’younak milyana bilhobb wilhaneen. Oh, you curer of thirsty hearts, supply the thirsty with water. Your eyes are full with love and compassion. Wana winta ya nour el-a’ain. Rouh iwsaknaak jazabain. Me and you, Oh you sparkling eyes. A soul and appealing closeness. Aah, aah, ha, ha, aah, aah, ha, ha, aah, aah, ha, ha, wa, wa. Aah, aah, ha, ha, aah, aah, ha, ha, aah, aah, ha, ha, wa, wa. Wilnaas a’ind-ha amar, wana a’indi amarain. And people have one moon, but me, I have two. A’ala baabi, wa-aif aaamarain, aaamarain, aaamarain, amarain, amarain. Two moons are standing at my door. Ah, two moons, ah, two moons, two moons, two moons.